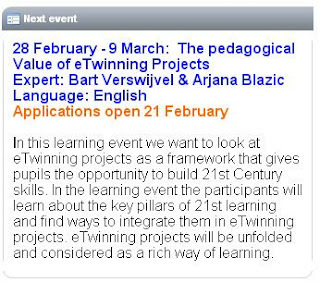 Today I'm proudly announcing and inviting you, dear readers, to take part in the learning event The Pedagogical Value of eTwinning projects, which I'll be running with my Belgian colleague Bart Verswijvel in the Learning Lab from February 28- March 9. Learning Events are short online courses aimed at improving teachers' skills and putting them in touch with other eTwinners. Learning events take place in a specifically designed platform called the Learning Lab. As you can read in my bio, I'm an avid user of web 2.0 technology and have been using it in my classroom for quite some time now. I must admit, however, that at the beginning of my tech journey, whenever I got excited about a tool, (and that happened quite a lot and quite quickly) I introduced it to my students and in most cases, it was all about learning about technology, not about learning about the subject matter. But with time I learned that technology is not an end in itself. Teaching isn't and can't be all about technology! Teaching is about pedagogy - about the act, process or art of imparting or acquiring particular knowledge or skills. However, with such an abundance of web 2.0 tools that we can use in our classrooms today, more often than not we are not sure how to choose a tool that will add a new, innovative value to the pedagogy. As Andrew Churches aptly points out, there are three levels of technology use: from Teaching About Technology (literacy use) through Teaching With Technology (augmentative/integrating use) to Teaching Through Technology (transformative use). And this is where Bart and I want to take you, dear readers - there where technology enhanced learning seamlessly occurs. Join us for this journey. We promise you lots of fun with learning. Applications open on February 21.